Live sports betting is finally legal in the US, and the 888 Sport app is the perfect companion for fanatics looking to make a little extra cash. If you’re in New Jersey, download the 888 Sport app now and start winning real money betting on your favorite teams! With many sports to choose from, the 888 Sport app is the premier sports betting app for New Jersey sports fans. Plus, with the promo and bonus codes we’ve listed here, you can earn bonus cash today! Sign up today at 888 Sport and you can get $10 free with no deposit required (Terms and conditions apply.) This means you can download the app, sign up, and start betting on real matches today without spending a dime. The 888 Sport app is easy to download and install, and with this 888sport bonus, you can jump right into the action. Many online sportsbooks are available for free download, but 888 Sport is the best app for New Jersey sports fans, hands-down. 888 Sport is one of the most easy-to-use sportsbook apps, pays good odds, and has promos and sign-on bonuses to get you playing right away! You can bet on your favorite matches and games easily and in real-time. Plus, with everything from Premier League to MLS to WNBA to NCAA, there’s something for everyone. 888Sport also allows NJ residents to use their $10 promo offer towards their first bets, getting you playing right away. The $10 bonus startup cash is a great way to demo the app, but you won’t want to uninstall it once you start playing. 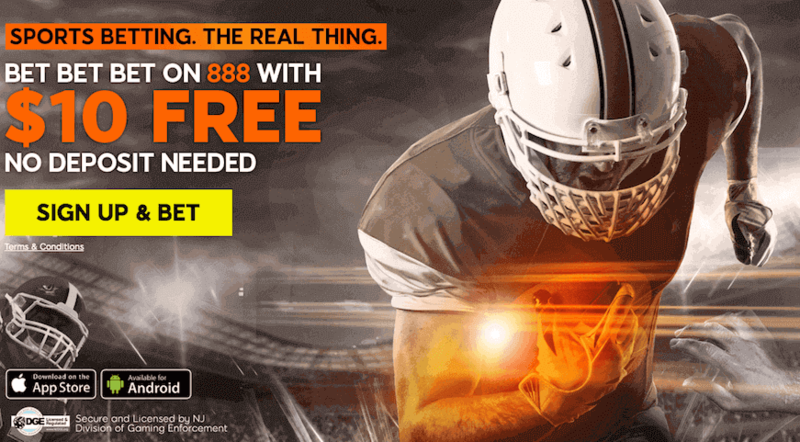 New laws in the US have made it easy and legal for you to download and play 888 Sport today, though right now the app is only available in New Jersey. Don’t worry though– as long as you’re in NJ, you can play! The best thing about the 888 Sport app is that no deposit is required. With no cost to you, you can start winning real money now. And with an extra 100% deposit bonus on high-stakes bets, you can earn up to $500 in extra cash! Who is eligible to play 888sport games? If you’re within the state of NJ and are of legal gambling age (21), you can download the app and earn $10 of free cash on the 888sport app. You need to be within NJ state limits to play. Is there an 888sport coupon? Yes! There is a $10 free credit to your account when you sign up. No deposit required! How do I add money / cash out? Banking is easy with 888 Sport. You can use credit or PayPal on the 888sport app. In addition, you can visit the Cash to Cage location in Atlantic City to manage your account, or visit a number of 7-Eleven locations to add cash to your account. Yes! You can earn a deposit bonus of up to 100% when you sign up and make one high-stakes bet, for a bonus of up to $500!